Saudi Arabia signed the Conventions on 18 May 1963, Additional Protocol I (Protection of Victims of International Armed Conflicts) on August 21, 1987 and Additional Protocol II (Protection of Victims of Non-International Armed Conflicts) on November 28, 2001. Moreover, Saudi Arabia became signatory to the Convention for the Rights of the Child (CRC) on 26 January 1996, as well as the Optional Protocol to the CRC on 10 June 2011. During the vote for adoption of the UDHR, Saudi Arabia was one of the 8 abstaining nations, and has been member of the OIC since 1969. Saudi Arabia has signed six of the eight fundamental ILO conventions, leaving the convention related to freedom of association (C087) and freedom of collective bargaining (C098) un-ratified. Saudi Arabia is not party to the 1951 Convention or its Protocol. The Convention on the Elimination of All Forms of Discrimination against Women – also called CEDAW, was approved during the General Assembly Session on 18 December, 1979 and entered into force on 3 September 1981. The Kingdom signed and ratified CEDAW on September 7, 2000. Countries that have ratified or acceded CEDAW are legally bound to put its provisions into practice, and thereby agree to submit national reports on measures taken to comply with its obligations. Such reports are to be compiled at least every four years. Three main reservations were made on the day of ratification, mainly the exclamation of non-obligation to observe the Convention in case of it contradicting Islamic law as applied in the Kingdom. Additionally, Saudi Arabia does not consider itself bound by Article 9 (2), concerning children’s nationality, and Article 29 (1), discussing dispute between states concerning interpretation or application of the Convention. It is noteworthy that Article 29 (2) specifically allows for such a reservation. The Convention on the Rights of Persons with Disabilities was approved during the General Assembly session on December 13, 2006 and came into force on May 3, 2008. Simultaneously, the Optional Protocol was approved, giving the Committee on the Rights of Persons with Disabilities (CRPD) competence to examine individual complaints with regard to alleged violations by States parties to the Protocol. The CRPD is the body of independent experts that monitors implementation of the Convention. Saudi Arabia acceded to the Convention as well as the Optional Protocol on June 24, 2008. Through “accession” a state accepts the offer or the opportunity to become a party to a treaty, which has already negotiated and signed by other states. It has the same legal effect as ratification. The Convention against Torture and Other Cruel, Inhuman, or Degrading Treatment or Punishment, also referred to as just the Convention against Torture, was adopted during the General Assembly session on December 10, 1984. On June 26, 1987 it was registered and thereby came into force. Its implementation is monitored by the Committee Against Torture(CAT), composed of ten individuals of various nationalities. All signatory states are obliged to send regular reports to the CAT, based on which recommendations are made. Saudi Arabia confirmed its accession to the Convention on September 23, 1997 with two reservations. The Kingdom does not recognize the mandate of the Committee as prescribed in Article 20, and does not consider itself bound by Article 30, paragraph 1 referring to disputes between States related to interpretation or application of the Convention. It is noteworthy that such reservations are allowed for as per Articles 28 and 30-2 of the convention, respectively. The International Convention on the Protection of the Rights of All Migrant Workers and Members of their Families was approved by the General Assembly on December 18, 1990 and entered into force on July 1, 2003. Saudi Arabia is not party to the Convention. Saudi Arabia acceded to the Convention on September 23, 1997, with the reservation that provisions will only be implemented if they are not in contradiction with the Shariah. Additionally it noted that it does not consider itself bound to Article 22, pertaining to inter-state dispute resulting from interpretation or implementation of the Convention, stating that all parties to the dispute are to expressly consent to intervention of the International Court of Justice. Saudi Arabia’s Basic Law of Governance states in Article 26 that the State shall protect human rights in accordance with the Sharia. In effect, however, many human-rights violations are reported due to failure to adhere to the state commitment to human rights. Saudi Arabia has been a member of United Nations since 1945 and is signatory to several conventions and treaties to respect human rights, one of which is the Arab charter for human rights. Moreover, Saudi Arabia has founded two government-supported human-rights organizations to help promote and document human-rights issues in the kingdom – the National Society for Human Rights (NSHR) and the Saudi Council for Human Rights. The two organizations report directly to the royal court and have the capacity to communicate and investigate human rights in various governmental entities. In addition, several non-governmental and independent human-rights organizations operate on the ground or online, collecting data and documenting human-rights violations and promoting human rights across Saudi society. Most of the international and regional objections concerning human rights in Saudi Arabia come from the limited rights granted by the state to its citizens and, in particular, to women and Shiite minorities. Various international human-rights organizations, such as Amnesty International and Human Rights Watch, maintain a published record on Saudi Arabia’s violations. Sometimes, successful communication with the authorities leads to the relief of a violent or stressful human-rights situation. The Basic Law does not guarantee basic rights, such as the freedom of belief, expression, assembly, or political participation. Punishment of individuals and groups accused of organizing a civil group or calling for a political party range from travel bans and prosecutions to arrest and imprisonment. The freedom of speech is limited, and individuals who use online or print media to express concerns involving members of the official religious establishments or religion in general, the royal family, or governmental officials can be punished. The state’s Wahhabi or Salafi version of Sunni Islam is the only public religion permitted in the country. Minority groups or migrant workers are not allowed to display publicly any religious practices or teaching. Media in all forms – online, TV and radio, and print – are subject to strict censorship to prevent political dissent and anything deemed culturally or religiously inappropriate, according to the country’s standards. Women’s rights are one of the main issues facing Saudi Arabia, because of the strict gender segregation and limited rights granted women for their self-determination. Women in Saudi Arabia are required to have permission from or representation by a male guardian to gain access to any governmental service. They cannot enroll in education, get certain jobs, or start a business without a male guardian consent or representation. In addition, the lack of a minimum marital age and codified family law subject many women to familial abuse or domestic violence, with no guaranteed legal redress. Corporal punishments such as amputation – and beheading – are applied based on strict Islamic jurisdiction. In addition, many prisoners of conscience remain in detention without charge or trial or are tried on false charges to curb their political dissent; this has recently given rise to national campaigns by activists to highlight their plight. 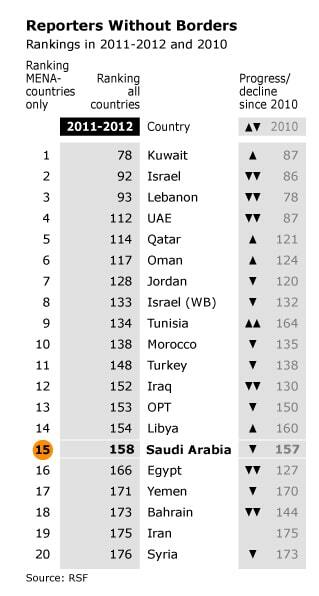 According to Reporters Without Borders, Saudi Arabia ranked 158 out of 179 countries in the 2012 Press Freedom Index. Strict censorship is maintained on news and information to preserve the control of the royal family and the religious establishment over the country. Self-censorship is high among journalists because of the insecurity in reporting and publishing. There are more than 400,000 websites on the Saudi official Internet blacklist, including political, religious, and pornographic sites. In 2009, the Lebanese LBC Channel in Jeddah was shut down for airing an episode on the promiscuity of a Saudi man. The man was arrested and sentenced to five years in prison and to hundreds of lashes. The reporter was sentenced to 60 lashes but was later pardoned by the King. In 2011, the young independent team of a YouTube program were arrested for several days for airing an episode on poverty in Saudi Arabia. A university professor, Mohammad Alabdulkarim, was jailed for several months for writing an online article revealing the corruption, and questioning the legitimacy, of the royal family. In 2012, a poet and journalist, Hamza Kashgari, was brought from another country and imprisoned for tweets considered offensive to religious scholars, in which he expressed personal views of the Prophet. Any foreign journalist or correspondent reporting from the kingdom must be accompanied by official minders to report on their work.